The Boston Red Sox clinched the American League East crown with an 11-6 win over the Yankees on Thursday night. This is Boston's third straight division crowd, as they now have a record of 104-49 on the season. Their 104 wins is already the second-most wins in Boston history, as they won 105 games in 1912 and 104 in 1946. They have nine games left (3 at Cleveland, 3 vs. Baltimore, 3 vs. Yankees) to set a new franchise record. It is surprising that Boston clinched the division on September 20th considering the fact that they were in a virtual tie with the Yankees at the top of the division in early July. The Sox surged in July, and when they swept the Yankees in a series in early August at Fenway Park, they took a 9-1/2 game lead on August 5 and never really looked back. The closest the Yankees got to Boston was 6-1/2 games on August 26, after the Yankees completed a four-game sweep in Baltimore and Boston suffered a three-game sweep in Tampa Bay. 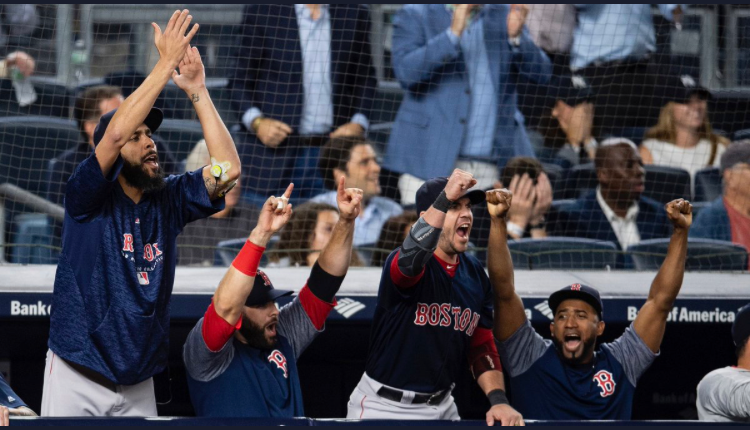 This past weekend, the Red Sox won the final two games of their series with the Mets at Fenway, while the Yankees lost two at home to Toronto, and that made it 10-1/2 games and their magic number was down to 2, meaning they had a good chance to clinch at Yankee Stadium. On Tuesday night, Boston had a 1-0 lead in the seventh when Neil Walker hit a three-run homer that was the difference in a 3-2 Yankees win. The next night, the Yankees rolled to a 10-1 win, putting Boston's celebration on hold once again. On Thursday night, Boston jumped out to a 4-2 lead, but their starter Eduardo Rodriguez saw his pitch count climb to 100 in the fourth inning, and he walked the bases loaded. Rodriguez was pulled with two out, and Heath Hembree came in to face Giancarlo Stanton, who hit a blast to right field for a grand slam to make it 6-4 Yankees. 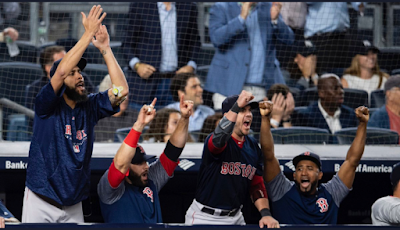 It looked like Boston would have to wait at least another night to clinch the division, but they went to work against Yankees starter Masahiro Tanaka in the fifth. Mookie Betts led off the fifth with a double, followed by an Andrew Benintendi single. That was all for Tanaka, and in came David Robertson from the Yankees bullpen. Robertson got J.D. Martinez to hit into a double play, but that brought home a run to make it 6-5 Yankees. Xander Bogaerts struck out swinging to end the frame. Chad Green came on in the sixth for the Yankees, and he struck out the side, and he stayed in for the seventh, only to allow Jackie Bradley, Jr. to hit a homer and tie the game at 6. After Green allowed a single to Christian Vazquez, that was all for him. Dellin Betances, who has struggled of late, was in next for the Yankees, and he struck out Betts looking for the first out of the seventh. Benintendi then laced a double down the right field line, and they intentionally walked Martinez to load the bases. Bogaerts hit a sacrifice fly to center, which didn't bring in just one run, but two when Yankees centerfielder Aaron Hicks airmailed a throw into the seats down the third-base line. Hicks was looking to hold Benintendi at second, but when it went into the stands, he was awarded two bases, thus giving him the plate and the Sox were up 8-6. Aroldis Chapman was next out of the Yankees bullpen for the eighth inning, in his first action since August 21. Chapman looked rusty and wasn't sharp, as he had trouble finding the plate. Rafael Devers led off the eighth with a single, while Jackie Bradley, Jr. earned a walk, and with two outs, Betts hit a bomb to right, a three-run shot to put it away and give Boston an 11-6 lead. After Stanton's grand slam in the fourth, the Yankees mustered just two hits against the Red Sox bullpen. The knuckleballer Steven Wright (it's a tradition that Boston always has to have one) went 3 innings, allowing just a hit and no walks, with 2 strikeouts. Craig Kimbrel worked around an Andrew McCutchen single to open the ninth and earned two strikeouts, getting Aaron Judge for the first out of the frame, and then getting Stanton to chase a pitch down and away to end it. This was the first time the Red Sox have won three straight division crowns, and they did it in style, with a comeback win against their archrivals. The Yankees also lost a game in the race for home field in the Wild Card game, as the Oakland Raiders, I mean A's, beat the Los Angeles Rams, I mean Angels, 21-3. The Yankees (93-59) are now 1-1/2 games ahead of Oakland (92-61) to see who hosts the one-game playoff for the right to take on the Red Sox in the Division Series.